Regulated deer hunts in Indiana state parks have helped restore the health of forests suffering from decades of damage caused by overabundant populations of white-tailed deer, a Purdue study shows. Jenkins said that while hunting may be unpopular with some, it is an effective means of promoting the growth and richness of Indiana's natural areas. "We can't put nature in a glass dome and think it's going to regulate itself," he said. "Because our actions have made the natural world the way it is, we have an obligation to practice stewardship to maintain ecological balance." 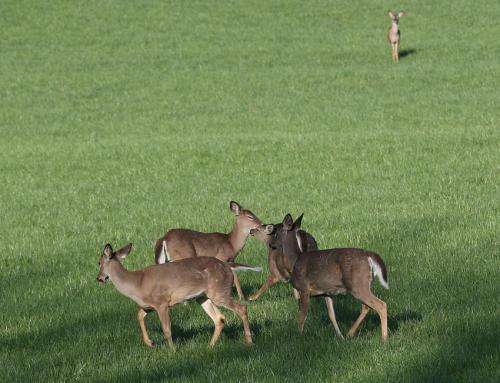 The health of deer in state parks also dwindled as their food sources shrank. To check the overabundant deer populations, the DNR introduced controlled hunts in state parks in 1993, with most parks adopting the strategy by 1996. "Hunting in natural areas is controversial," Jenkins said. "But when deer are overabundant, they start to have undeniable negative impacts on the ecosystem." Working with Christopher Webster, a Michigan Tech University professor and Purdue alumnus, Jenkins and then-master's student Lindsay Jenkins (no relation) tested the effectiveness of the hunting program by comparing the amount of plant cover in 108 plots in state parks and historically hunted areas with 1996-97 levels. They found that total plant cover in state parks more than doubled from 1996-97 to 2010. Herbs such as asters, violets and goldenrods increased from about 20 percent to 32 percent cover, and percent cover of grasses rose from 1 to 3 percent. Tree seedlings jumped from about 2 percent to about 13 percent of total plant cover, a finding that suggests when older trees die out, there will be younger trees to replace them, Jenkins said. "With heavy populations of deer, tree seedlings often don't have a chance to survive," he said. "In those situations, the forest could lose its ability to reproduce itself and eventually cease to be healthy." The study also showed that the hunting program led to the recovery of native species and discouraged the spread of invasive and exotic species, said Lindsay Jenkins. "We saw a striking improvement in the quality and diversity of the forest understory in state parks compared with conditions before the hunting program," she said. "The deer management program is having a clear, beneficial impact on Indiana parks and could serve as a good example for nature preserves with overabundant deer in other states." Good article but not really new news. This has been known for some time now. ""Hunting in natural areas is controversial," Jenkins said." It's even more controversial in un-natural areas like the supermarket and the zoo. "Because our actions have made the natural world the way it is, we have an obligation to practice stewardship to maintain ecological balance." A re-introduction of predators like wolves doesn't seem to have the desired effect on deer and moose populations the states have wanted(read this recently somewhere but I can't recall where). So hunting really does seem to be the easiest balance to this problem since wiped out predator populations aren't aloud to recover in most states or are unproductive(by human standards) in areas they are slowly being aloud to reestablish territory for what ever reasons. Hunting is one thing. It also helps to leaves those wolves, bears and cougars alone. That's true. But the problem is that deer are generally more inclined to hang around close to humans while predators are not, especially if they're being persecuted and harassed by people. In many National parks deer can be approached by people and they show little reaction while wolves and cougars are generally more shy. Bears fall somewhere in the middle but are only active for a portion of the year. Coyotes (desert wolves) are assuming the niche previously held by wolves in many areas. They are growing bigger and hunting in packs. As a result deer pops have plummeted. It remains to be seen whether they will become the threat to people that wolves are. Regulated hunting has been a boon to ducks, geese, deer, bear, turkey, pheasants and many others. I grew up in the 50's and sixties in northern Ohio, and there were no dear, turkey, pheasant, bear, ducks, black bass (small mouth) and geese. Now 30 years later, they are abundant. Even coyotes which were unheard of in my time are now stalking the woods. So letting the hunter manage the animal is a perfect solution. To many conservationist want wholesale isolation which is too dangerous. Portland, OR just killed a mountain lion that was lounging in a tree in a residential area. A deer jump through the window of a liquor store in suburban Boston a few days ago. Wolves are not a threat to people. Many species have been artificially reintroduced so regulated hunting us only partly responsible for their rapid return. This reintroduction in many cases is paid for by revenues from the sale of hunting licences, as is the purchase of state game lands and preserves. Another myth. They were exterminated in part because they were a danger. If their numbers are allowed to grow beyond carrying capacity we can expect them to become a threat once again. Just like humans. "Although wolf attacks on humans do occur, their frequency varies with geographical location and historical period. Gray wolf attacks are dangerous not only for the victims, but also the attackers, who are often subsequently killed, or even extirpated in reaction... The country with the most extensive historical records is France, where nearly 7,600 fatal attacks were documented in from 1200–1920. In modern times, they occur most often in India and neighboring countries." "Sandra L. Piovesan bled to death after being mauled by a pack of nine wolf dogs that she had raised as pets and was so devoted to that she once told a neighbor they "give me unqualified love." "
All dogs can attack people, even our beloved (domesticated) pets. As it clearly says, those were wolf-dog hybrids, not pure wolves. Nine of them confined to a small pen. She deserved to die. Looks like otto strikes a Disney nerve. I'm not worried about wolves because there aren't any around here. If I was in India or neighboring countries, or in France a few gens ago, I would be worried about my kids, my livestock, and myself in the woods after dark. Wolves are wild animals with a collective killer instinct. Just because they're not around doesn't mean they're not dangerous. They're very dangerous. "She deserved to die." What a retard. "A rat is a cat is a dog is a boy." But only the boy deserves to die right barakn? Especially if he's outside after dark in India. Because wolves are, you know, natural. Serves him right. Natural selection is the way of things nicht wahr? Question. What do wolves eat? Answer. Meat. What are humans made out of? Meat. The only reason wolves (and bears and cougars and wolverines et al) aren't the problem they used to be is because they have learned to fear humans. That, and they mostly don't exist any more. But the instinct is there. If their numbers are allowed to recover we will again be on the menu. Like India. BTW wolves ARE attacking people in the US . "Coyote attacks on humans... have been increasingly frequent, especially in the state of California. In the 30 years leading up to March 2006, at least 160 attacks occurred in the United States, mostly in the Los Angeles County area." -Like I said, desert wolves are assuming the role of their relatives. Canine behavior is flexible and can adapt to a wide variety of niches which is why they have been so successful. They ended the reign of the terror birds.